Sautéing is the technique of cooking thin cuts of lamb in a small quantity of hot fat in an uncovered pan. This is considered a 'dry heat' method because fat does not contain water. Sautéing differs from frying in that less fat is used. It is actually the same process as searing except that sautéing completely cooks the meat and searing is simply a means to brown the meat so that the cooking process can be completed with another method (usually when cooking thicker cuts). It is important that the meat surface is dry when it is placed into the pan so that it browns rather than steams, and that the pan and cooking fat are both hot enough to brown the meat quickly. The pan should not be crowded; cook in small batches if necessary. Choose fat that doesn't burn at high temperatures. Many cooks prefer to use heart-healthy oils such as canola or olive oil. Both work well for sautéing. Butter may be used for the rich flavor it provides, but it should not be used alone because it will burn easily. Use butter in combination with oil. Lamb for sautéing should be tender and not more than an inch thick. Lamb chops and liver are good choices for sautéing. 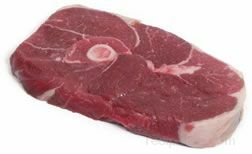 Tougher cuts from the shoulder should be braised or roasted. The meat should be patted with paper towels in order to remove excess moisture, which helps the meat brown more quickly. Preheat the skillet on the stove before adding the oil. 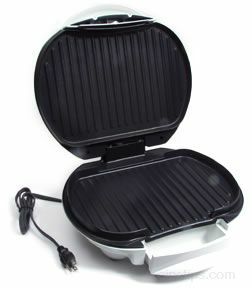 Medium-high heat is sufficient to warm the pan to the proper temperature. If the heat is too high, the oil will begin to smoke shortly after it is poured into the pan. Tender cuts of lamb can be added to the pan as is. 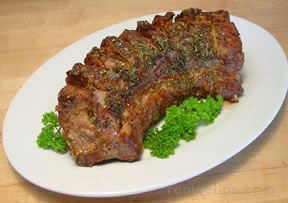 Light seasoning is all that is necessary to bring out the full flavor of the meat. The oil should sizzle when the beef hits the pan. If it doesn't sizzle, the pan and oil are not hot enough. 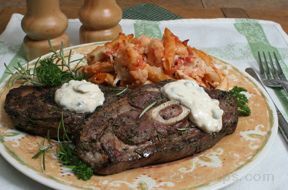 The meat should be sautéed uncovered and if several pieces are cooked at one time, the pieces should not touch. Do not crowd the pan. Cook the first side until golden brown in color, which requires approximately 3 minutes. 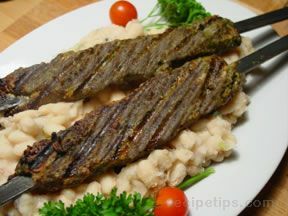 Using tongs, turn the meat over and finish cooking on the second side, again for approximately 3 minutes. Never use a fork to turn the meat because piercing the meat with a fork may allow juices to escape. 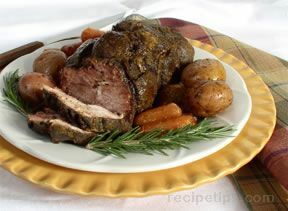 The meat should be turned only once because turning it more than once can affect the color and flavor. Adjust the heat if necessary while cooking. Sautéed lamb may be served with a sauce made from the pan drippings. The meat is removed from the pan and a small amount of liquid, such as broth, stock, juice, or wine is added to the pan in order to loosen (deglaze) the flavorful caramelized bits that have stuck to the pan during cooking. After the liquid has reduced by about half, other herbs and spices are added, depending on the type of sauce desired. The entire process requires only 2 or 3 minutes to complete. Pan-frying is similar to sautéing with a few exceptions: more oil is used; the cuts of lamb do not have to be thin; and the cooking process requires more time than sautéing. 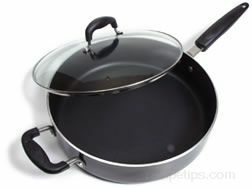 The skillet used for pan-frying should have a heavy bottom so that heat will be conducted more easily. A large, well-seasoned, cast-iron skillet works well or a heavy nonstick pan may be used. Make sure the pan is of adequate size so that there is plenty of room for the meat to brown. If the pan is crowded, the meat will steam more than it will brown. Following the same basic steps as sautéing, the skillet should be preheated over medium-high heat. Oil is added to the heated pan in a quantity great enough to well coat the pan (less oil is used when sautéing). The meat should be patted with paper towels to remove excess moisture. The meat can be seasoned and then placed in the pan with the heated oil. The oil should sizzle when the meat hits the pan: if it doesn't sizzle, it is an indication that the pan and oil are not hot enough. Like sautéing, high heat is used to sear the meat to create a flavorful browned crust. 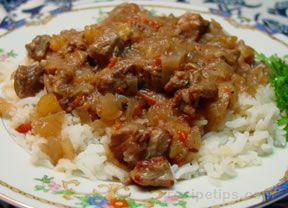 Unlike sautéing, the lamb can be turned more than once (after the meat is seared) because the pieces are larger and require a longer cooking time. 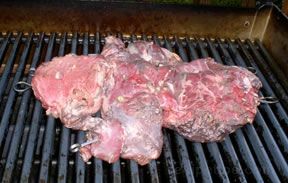 Do not use a fork to turn the meat in the pan because piercing the meat will allow juices to escape. A tongs or spatula are the best instruments to use. 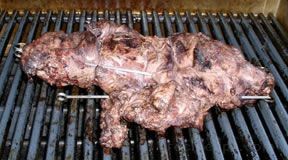 The goal is to produce meat that has a brown, crispy surface with tender, juicy, and flavorful meat inside. Blade, arm, or loin chops up to an inch thick are good candidates for pan-frying. 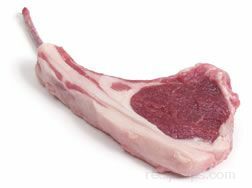 Thick lamb chops may be fried to any degree of desired doneness, but it is recommended that the internal temperature reach 145°F to ensure that harmful bacteria have been destroyed. A meat thermometer can be used to check the internal temperature. 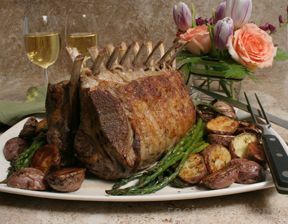 A thick chop that has been cooked to an internal temperature of 140°F or so, may be removed from the pan, covered, and allowed to rest for a few minutes. The temperature will continue to rise about 5°F, reaching the proper doneness. 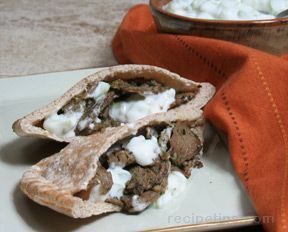 This also allows the remaining meat juices to settle, resulting in tender, flavorful lamb.